I have been working out of Napa since late January of 2015. As a result, a number of annual events have repeated. The Marriott hotel where I am staying is again full of Raiders and Raiders fans. 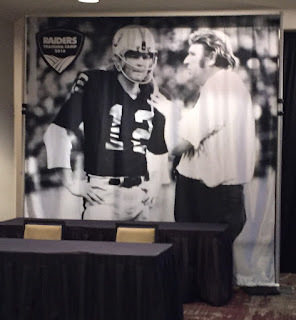 Training camp for the Oakland Raiders begins on July 28 when veteran players report to the Napa Valley Marriott. The first practice is on July 29, from 11 a.m. to 1:30 p.m., at the adjacent 2 1/2-field Redwood Middle School facility, which has a fieldhouse. Rookies are scheduled to report to camp on July 24. This marks the Raiders’ 21st summer in Napa.